You are here: Home » News » Industry news » Air Source Heat Pumps for House Heating – Energy Costs Too High? Some users complain that the power consumption of their air source heat pump for house heating is very high, not as energy-saving as advertised! In fact, there are many factors affecting the power consumption of heating, such as building insulation, heat pump quality and selection, heating ways, user's operating habits and so on. It would be unwise to only put the blame on the air source heat pump. The energy consumption of air source house heating, first of all, must be related to the building's enclosure structure, doors, windows, storey height, wall insulation and so on, which are important factors. If the window is made of large and single-layer glass, then the heat dissipation is relatively much higher and more heat supplement is needed. In the selection of the heat pump, you should consider higher value of heat load. The higher the room height, the greater the heat dissipation. For the same wall, there is a great difference between thermal insulation and non-thermal insulation. In addition to these, balcony orientation and wind speed will also affect the building's demand for heat. Whether the product design is reasonable, what the components are like and how the workmanship is, will have an impact on energy consumption. For example, the reasonable defrosting logic of air source heat pump should be: defrosting thoroughly only when there is frost. If the design is not reasonable, heat loss during defrosting will be very large, which does not only affect COP, but also affect the temperature fluctuation in the room. Whether defrosting is good or not depends on several factors, such as technical scheme, production and workmanship consistency. The consistency of workmanship is the basic skill and strength of the factory. All this will have an impact on defrosting. If the defrosting logic is good, but the product is not, the same problem will occur. Whether a right heat pump is selected is a factor that is easy to overlook. For example, a heat pump unit with high heating capacity selected for a small room must cost a lot. If a small air source heat pump has been working for long hours in bad conditions, it may also cost a lot. For example, the reasonable allocation of a 100 square meter house is 5P air source heat pump (about 18KW) while a 9KW heat pump would be too small. If the unit has been working on a very high water temperature, that is, very bad working conditions, this in fact is also unfavorable. A heat pump unit, like human beings, has its working limits. 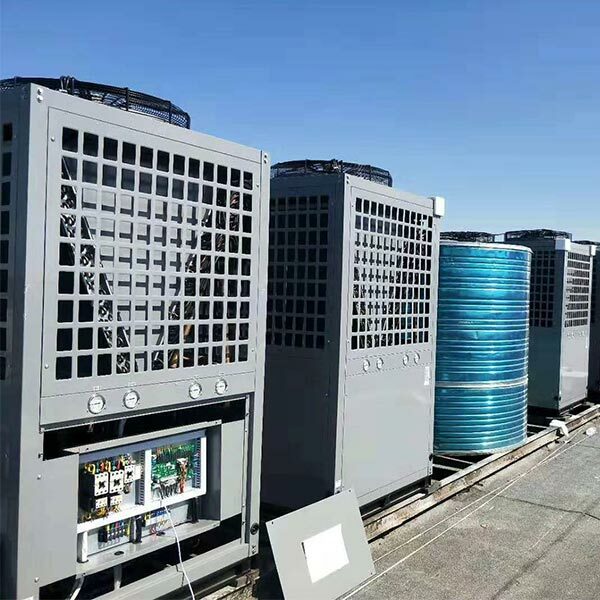 If heat pump selection is not a problem, it cannot be said that the whole house heating system is reasonable, because the system includes a heat pump unit and its end system, such as floor heating, radiators or fancoils. The energy consumption is very different between these heating ways. Since the requirement of water temperature is different at different ends, the required amount of heat is naturally not the same. Generally speaking, the requirement of underfloor heating for water temperature is the lowest, normally in the range of 35℃-40℃. Next comes to fancoils while radiators have relatively high requirement for water temperature, especially traditional cast iron radiators, which generally requires 60℃ or even higher. At such a high temperature, it is not appropriate for the heat pump to work, and the energy efficiency is relatively low. In addition, the size of water pump can not be ignored. Especially for small houses, the power consumption of the water pump actually accounts for a large proportion. When choosing water pumps, installers like to choose a bigger size, because if the water pump is too small, water can not reach the far end, indoor temperature is uneven and comfort level would also be affected. And if the water pump is bigger, although the energy consumption will increase, it at least can ensure room temperature comfort. If energy consumption is priority, then choose a smaller water pump; if indoor comfort is priority, then choose a larger one. The installation location of the heat pump unit is also important. To ensure smooth intake and exhaust air, the unit should not be placed close to the wall; instead, maintain a reasonable distance. Avoid the influence of dirty air flow, and facilitate the cleaning of the heat exchanger of the outdoor unit. Some users say that the energy costs of their air source heat pumps are high, and they often neglect some of their own factors. For example, there is a huge difference in energy consumption between indoor temperature of 21℃ and 24℃. Every time the room temperature rises by 1℃, the energy consumption rises by about 10%. Therefore, if users want to save more electricity, it is better to lower the water temperature on a reasonable level. In addition, although we tell users not to shut down frequently after installation, many users still do that. In their understanding, they will feel that it is very power-consuming for the heat pump to keep working, so as soon as leaving the house they just shut down the unit, which in fact cannot save electricity but increase it. Moreover, some users like to keep windows open, because the indoor temperature is high when heating and they feel that the room is stuffy. In this way, a lot of heat will be dissipated, which is a waste of energy.